﻿The club runs regular coaching sessions for juniors and adults throughout the year. 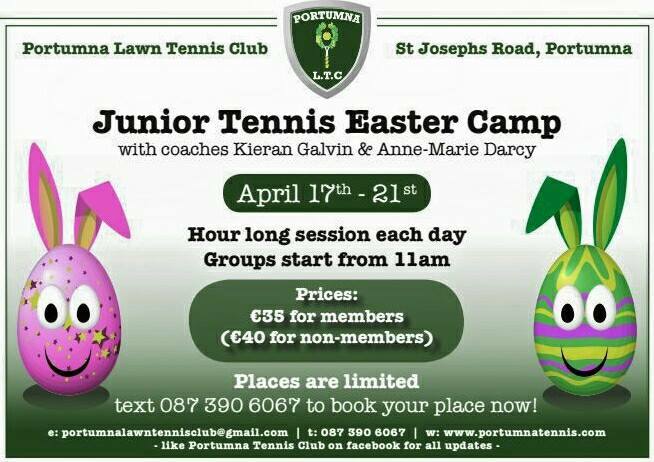 These include camps for juniors held during both the Easter and Summer holidays and open nights for adults. All sessions are announced/advertised in advance via this website, our Facebook page and posters/flyers. The cost is 30 Euro for members and 35 Euro for non-members. To book or for more details, contact us at: 087 3906067. The club will host a week long coached camp for children, coached by Kieran Galvin, each day from Bank Holiday Monday, August 1st to Friday August 5th. Text or call 0873906067 to book a place. To kick-start the 2016 Season, the club are hosting an Adult Open Night on Monday, 18th April at 7PM. Coach Kieran Galvin will be on hand to introduce the basics of the game, and provide tips. The club will run a 4 week coached course for adults, coached by Kieran Galvin, starting on Sunday, 24th April (times and cost to be confirmed). The club will run a 6 week coached course for juniors, coached by Kieran Galvin, starting on Sunday, 24th April (times and cost to be confirmed). Further details will be provided in due course. The club will run a 4 week coached course for juniors, coached by Kieran Galvin, starting on Monday, 5th October from 4-7PM. The cost is 30 Euro. To book, contact us at: 087 3906067. Want to learn how to play tennis? Would you like to improve any aspect of your game? Serve, volley, backhand....Now is your chance. A 4 week course for all levels, coached by Kieran Galvin, will start on Sunday, 11th October from 7PM. The club will run a 4 week coached course for juniors, coached by Kieran Galvin, starting on Monday, 7th September from 4-7PM. A 4 week course for all levels coached by Kieran Galvin will start on Friday, 11th September from 8PM. A 4 week course for all levels coached by Kieran Galvin will start on Monday, 15th June from 7-8PM. The club will run a 4 week coached course for juniors, coached by Kieran Galvin, starting on Monday, 15th June from 4-7PM. The club will host a 4 week series of coached Progressive Doubles with Kieran Galvin, commencing on Sunday May 10th at 6PM. There will be both A and B sections. The entry fee for each night is 5 Euro. Text Keith (087 2439481) or Gill (087 6167829) to enter or for more information. If you cannot commit to at least 3 of the 4 weeks, please enter as a sub rather than as a player. As a follow up to our open nights the club will host Tennis Express lessons with coach Kieran Galvin. These will commence on Monday, 11th May at 7PM and will run for four weeks. The cost is 30 Euro. Please text 087 3906067 if you wish to take part. To kick-start the 2015 Season, the club are hosting two Adult Open Nights to encourage new members. Coach Kieran Galvin will be on hand to introduce the basics of the game, and provide tips. We will supply rackets and balls. All you need are runners and, best of all, there's no fee. We run Coaching Lessons for a range of age groups throughout the year. The sessions will be for all age groups including children, teenagers and adults. Please contact the Tennis Club on 087 3906067 or message us on Facebook if you would like to book coaching lessons.